CLICK HERE to access a PDF version of this presentation! 11th Annual Networking Seminar: 9 Days! Not sure what you want to do when you graduate? Are you a freshman still figuring out what you can do in STHM? Then the 11th Annual Networking Seminar is for you! 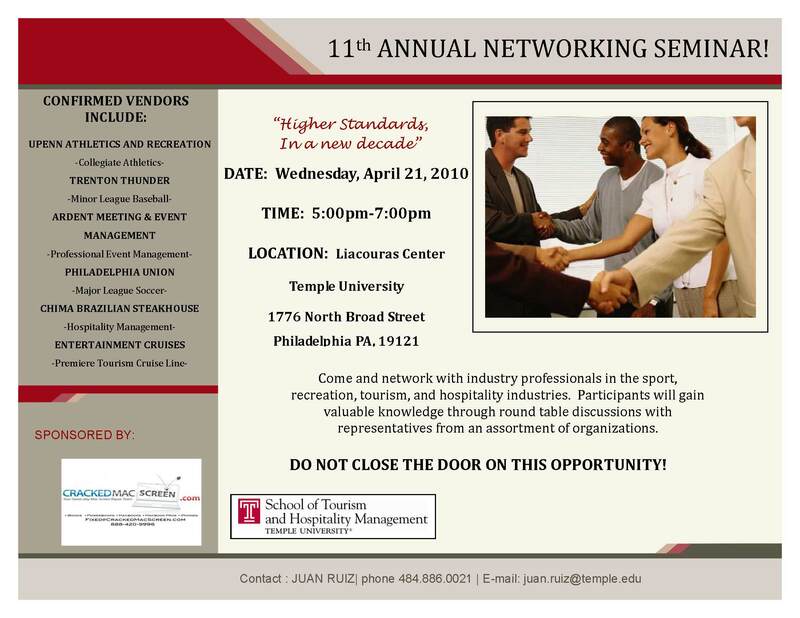 We have 20 vendors from the tourism, hospitality, sport, and recreation fields coming to Temple University’s Liacouras Center on Wednesday, April 21 from 5-7 PM. Cost is FREE. Dress is business professional. Resumes are not accepted (business cards only). This is your chance to pick the brain of industry professionals to find out how they got to where they are now! Below you will find the list of vendors and a description of each. Click the logo to see their website. The University of Pennsylvania is an Ivy League school located in West Philadelphia. Penn’s athletic program plays host to 16 different sports, many of them for both men and women. Penn-Recreation provides students with fitness programs and sports at both the club and intramural level for men and women. The “SWB Yankees” are the AAA affiliate team of the New York Yankees. They made PNC Bank Field in Moosic, Pennsylvania their home in 2007. In 2009 they finished their season as runner-up in the International League Championship. Roger Clemens and Jason Giambi have both played as a Scranton/Wilkes-Barre Yankee. The Holiday Inn Express Midtown is an affordable hotel located in the heart of Downtown Philadelphia. The hotel offers many amenities to its guests as well as easy access to many attractions in the downtown area. The Philadelphia Convention Center is within walking distance as well as many businesses and restaurants. The HUB was established by John New and Bill Decker as a professional meeting place for companies. They also host parties, lunches, and a variety of other hospitality events. The HUB offers amenities such as digital projectors and screens, whiteboards, high-speed wireless internet, big screen televisions and much more. Congratulations to Kate Wells for winning our second contest! You will receive an email shortly about how to claim your prize. Our runner up was our first contest winner, Stefanie Johnson. Thank you for your participation once again! Jeanie has attained an Associates Degree in Liberal Arts at the Community College of Philadelphia. She transferred to Temple University because of her interest in the School of Tourism and Hospitality Management. Jeanie’s favorite class is Hospitality Operations because she likes the hands on approach that Professor Greg DeShields provides for his students. Some events that Jeanie has experienced this semester in this class include the sales blitz, housekeeping project, and her final project consists of students creating their own hotels. Prediction for her favorite STHM class: Jeanie is eager to start Senior Professional Development Seminar and thinks that this class will be her favorite. STHM related class: Jeanie would teach Introduction to Tourism and Hospitality Management because she feels as though she could teach the students all about her experience in the program. Non-STHM related class: Jeanie would teach Family and consumer Sciences or Family economics. What are your thoughts on Globalism and the Tourism and Hospitality Industry? Globalism is a very important part of the Tourism and Hospitality Industry. It will only continue to grow and it is important that we are educated on this topic. Management Information courses can teach us everything we need to know with regard to this subject. Jeanie is flexible and does not have a specific preference, however, since she is comfortable with fundraising and membership she would like to be exposed to a different position. Jeanie feels as though there should be more of an emphasis on the Sport and recreation classes. She feels as though this major does not provide as many opportunities as the Tourism and Hospitality major. She feels as though a class similar to Hospitality operations that is related to Sport and recreation management would help with this issue. In five years, Jeanie would like to be living on the West coast in California preferably in San Diego at a Boutique Hotel. Jeanie also hopes to hold and maintain a management position at a hotel similar to the Kimpton. 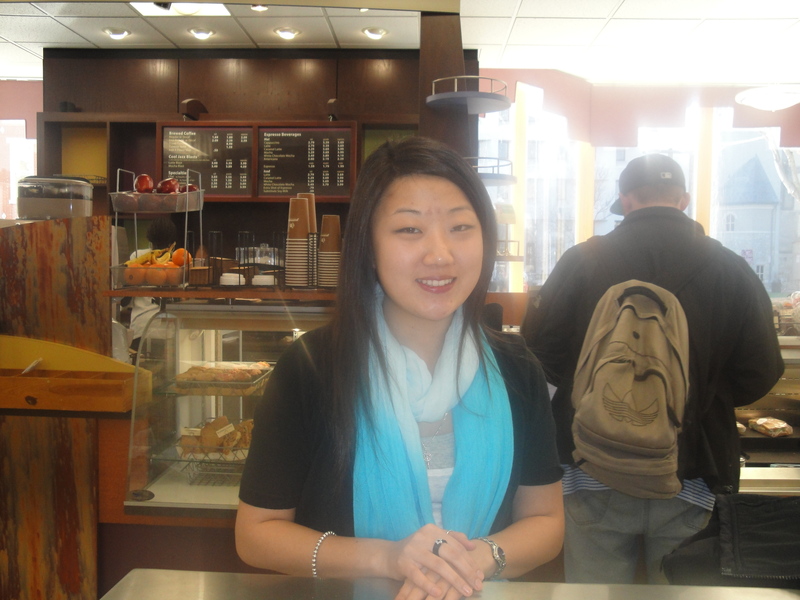 Jeanie would like to become a hotelier/entrepreneur and a good mentor for future leaders of the industry. With regard to the fund raising events – Prices to attend these events are sometimes too high and students cannot afford to attend. Jeanie feels it would be a good idea to survey themes and locations to get students opinions. She would like senior seminar students to ask undergraduates and take votes on locations and themes of events. CLICK HERE to access a PDF file of this presentation! 11th Annual Networking Seminar: 13 Days! Only 13 days left! Check out our older posts for our flyers and promotional video! 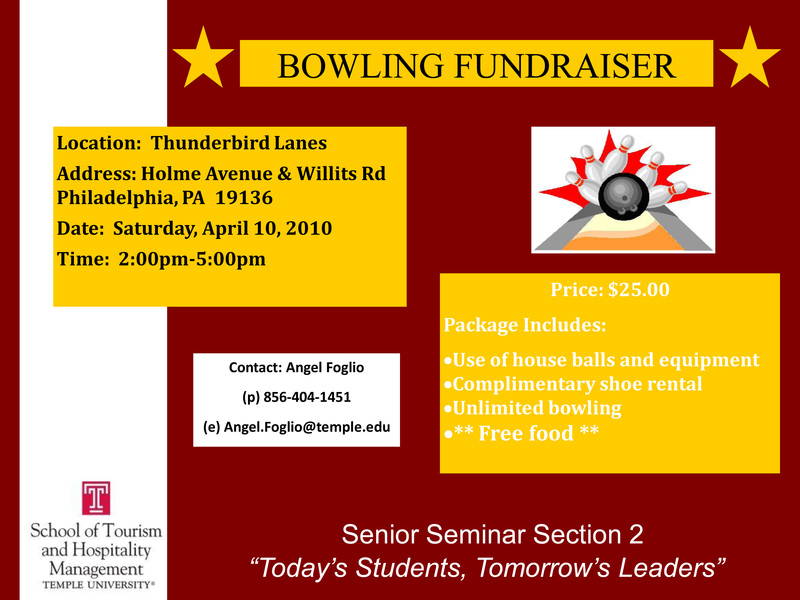 Come to Thunderbird Lanes this weekend! 11th Annual Networking Seminar: 14 days! It’s official… only 2 more weeks! Check out our website for a list of confirmed vendors! Only 15 more days! Check out our vendors for more information! The Stadium Managers Association (SMA) is an organization that educates and provides industry resources to assist professional and collegiate stadium managers in achieving the highest levels of facility administration and operation. SMA supports and promotes the professional relationships and networking among stadium managers, league officials and industry suppliers that contribute to the success of our members. The Association is committed to being the primary industry resource for Sports Facility Managers and Leading Suppliers in the stadium industry. Thank you to our newest sponsor and to our continued sponsorship from Primos, CrackedMacScreen, and Xerox!